You’ve likely heard it before, you Network equals your Net Worth. David Phelps spends his life teaching others the importance of this single sentence. He also shares it with us here today in this FlipNerd.com Flip Tip. Short and sweet…check it out! Mike: Hey, it’s Mike Hambright from flipnerd.com, and we have a quick VIP tip to share with you from David Phelps, who’s going to tell us why your network is your net worth. David: Mike, a lot of people try to build a platform where they have freedom. They want to build up assets so they have security and financial freedom to live a life they want to live it. The problem is many of us don’t have a lot of time. So what’s the real fast track to getting to where you want to go, to reaching really any goal? And that would be developing your associations with other like-minded people. Jim Rohn [SP] said, “You become the average of the five people with whom you associate with the most.” And I think that’s really true. So you’ve got to go out and take the time, this is very important, take the time and the discipline to be around other people, find the groups, find the mentors, find the coaches, be in a mastermind group as Napoleon Hill writes about, and think you can grow rich. That to me is the key. Everything else is secondary, your education, your formal education. The right people will help guide you. They’ll give you the backdrop, the safety net, the feedback, so that when you have questions about well, do I do A or do I do B, do I do this or do I do that? It helps you remove the fear factor so you will take steps forward instead of staying in that, kind of, uncomfortably comfortable zone in your life where you might be right now, wanting to go further, wanting to create more security for your family, but you just don’t know how to do it. Get around other like-minded people who have been there, other entrepreneurs who will guide you and when you’re thinking about doing something, give you the clarity and focus so you know you are taking the right steps. That’s the key, your association with other people, networking, masterminding, would be the quick tip for today, Mike. Mike: Thank you for joining us for another Flip Nerd Flip Tip. We’d also like to thank our featured sponsors, Home Depot, B2R Finance, and uglyopportunities. com. 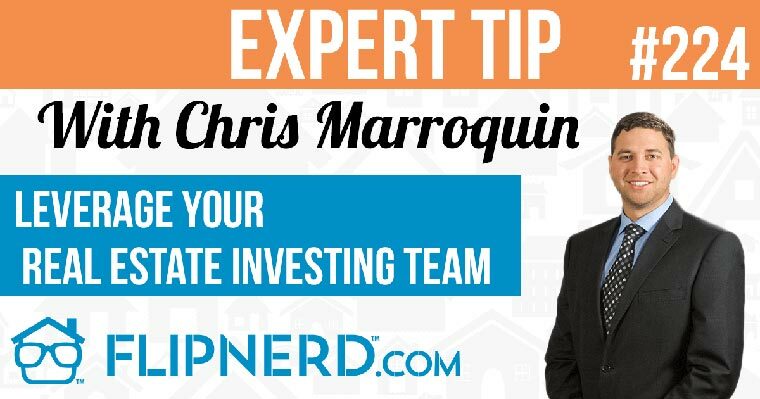 To listen to more flipnerd.com Flip Tips, or full interviews with the most successful real estate professionals in America, please check out flipnerd.com or the FlipNerd podcast in the iTunes store.